I am sad to see October end, its my favourite month for many reasons, but welcome November. We received seven lovely contributions to #EatYourGreens this month. 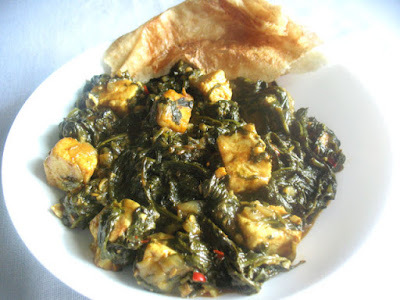 The first recipe comes from Linsy Patel who blogs over at Home Cook Food. 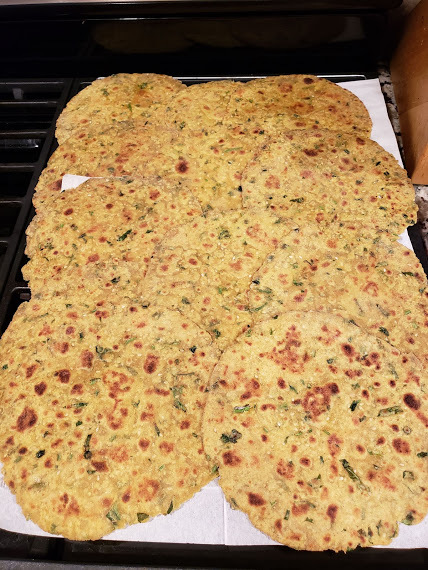 Linsy shared with us some of her Jowar Flour - Thepla - Sorghum Flour Flatbreads made with fenugreek, coriander and mint. 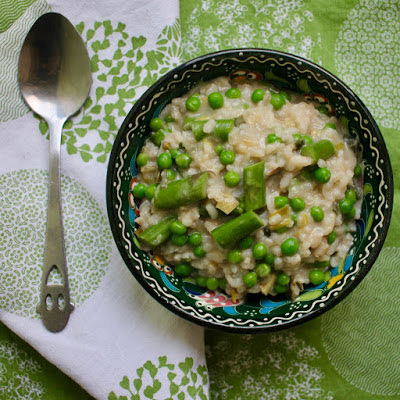 Next we have Johanna from Green Gourmet Giraffe with a dreamy Creamy Spring Risotto Soup made with leeks, peas and my husbands favourite green vegetable - asparagus. Lisa's Kitchen makes a welcome return and shares with us a silky bowl of Palak Paneer - Spinach with Cheese. I would be so happy to tuck into this with the fenugreek flatbreads shared above. 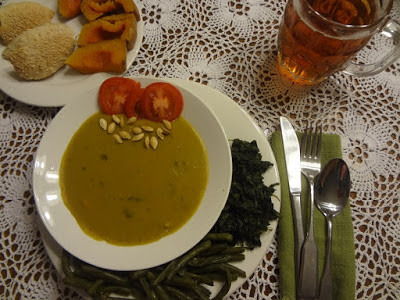 Teresa from Affectioknit shares with us her dinner and movie which include a lovely bowl of Split Pea Soup served with spinach and green beans. By the way, the movie she was watching was ParaNorman - have you watched it?! We have another soup, this time from Laura who blogs over at Touchwood. 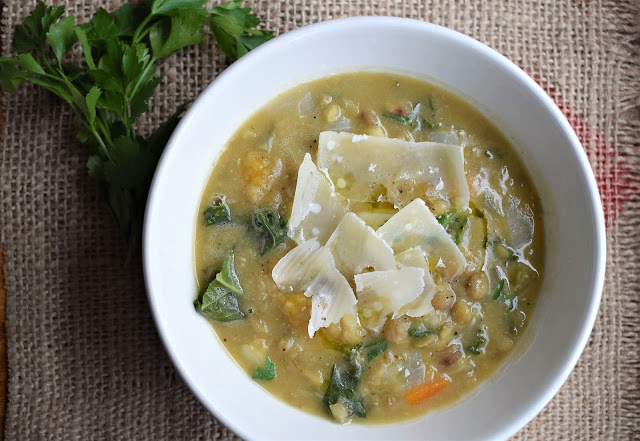 Laura shared Detox Balance Soup made with green lentils, leeks and lots of other vegetables, it even got the thumbs up from her kids. 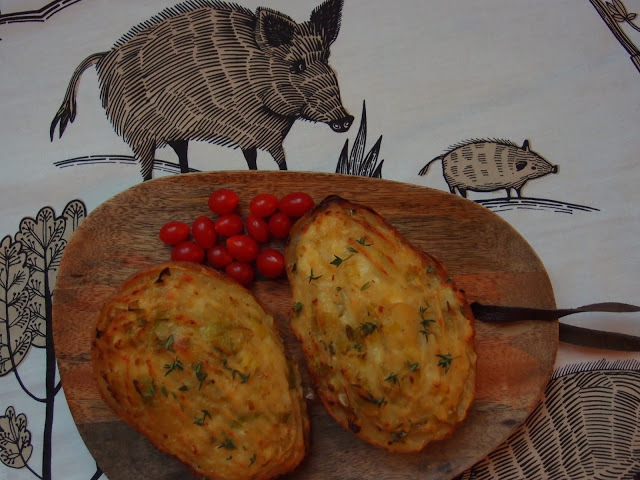 My co-host the Veg Hog shared a rather comforting Stuffed Potatoes Skins with Leeks and cheese, now don't you want to stick your folk in?! I do. And finally my own contribution is this Black Chickpeas Salad with Coriander. Thank you to all the contributors for taking time to share their recipes with #EatYourGreens recipes, both and my co-host The Veg Hog really appreciate your participating and hope you will continue to support us as long as we continue to host. 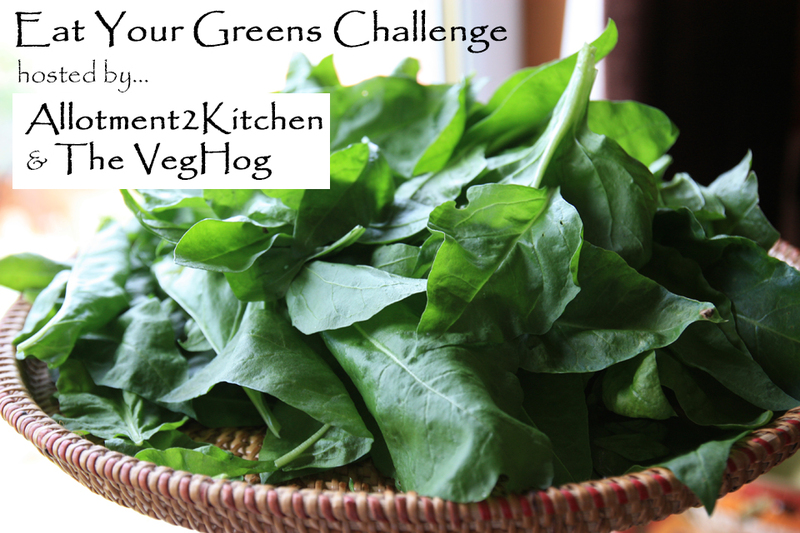 Now please to on over to The Veg Hog who will be hosting #EatYourGreens challenge in November. Please Follow this link on how to join in if your new. When the opportunity presents itself, I do like going to farmers markets to see what's in season and also what new and what different vegetables I can get hold off, plus I am always looking for inspiration. It did not disappoint I came home with a purple and green cauliflower. At the time I was not sure what to make with it to be honest, but that is me - buy first - think later. 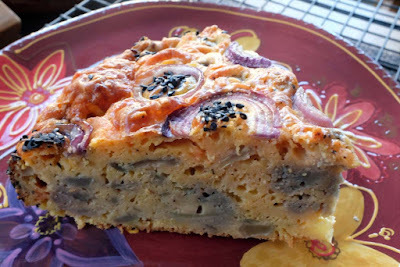 At one point I had considered making a warm cauliflower salad with them, but then D suggested making a Savoury Cauliflower Cake that I made many years ago. 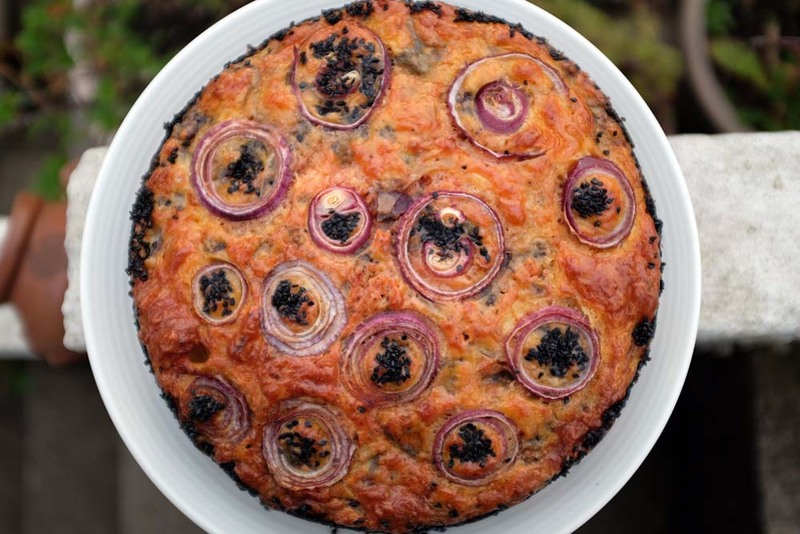 I don't make this Savoury Cauliflower Cake that often because it uses 10 eggs, but as we had some friends coming over, I thought it was worth the effort. 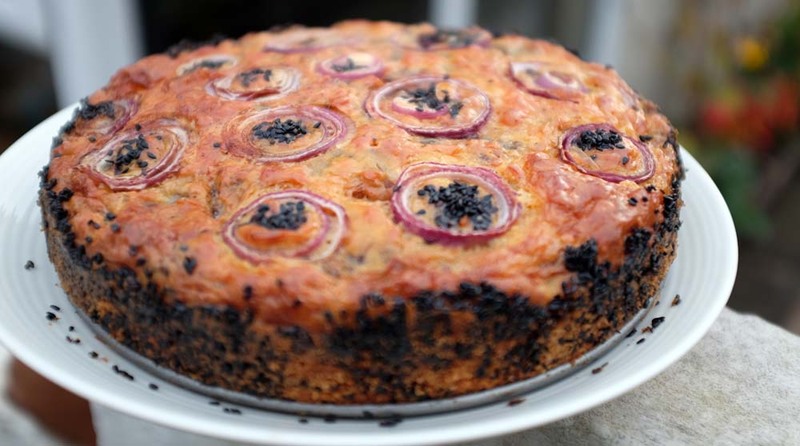 Of course in true Shaheen style I adapted it a little from the original recipe only in that I added some beetroot powder to the egg batter. 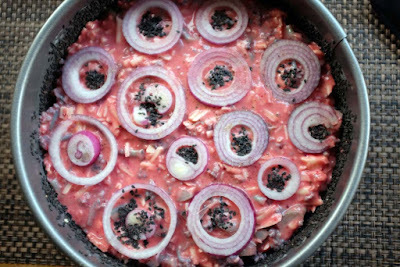 I also made the topping looking a little more pretty with red onions filled with some black sesame seeds. Here it is looking vivid and incredible before going into the oven to be transformed into a golden bake. This is not a recipe that you knock up after work. 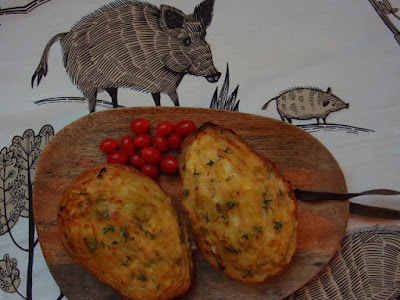 Its takes time from steaming the cauliflower, cracking 10 eggs, grating the cheese - I know so much work - but its worth the effort when your guests exclaim 'Wow'! 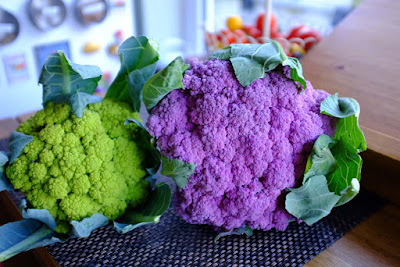 Just a shame when you slice into it that the beetroot colour has faded upon cooking and so did the steamed purple cauliflower. Shame really, still it was a very nice savoury cake to eat and share. I am going to a gig tonight and am looking forward to it. It hosted at a Miners Institute in the Welsh valleys. D is taking his camera, so who knows I may be able to share more later in the week, but before I go off gallivanting, I thought I would share this orange and black bowl of food. 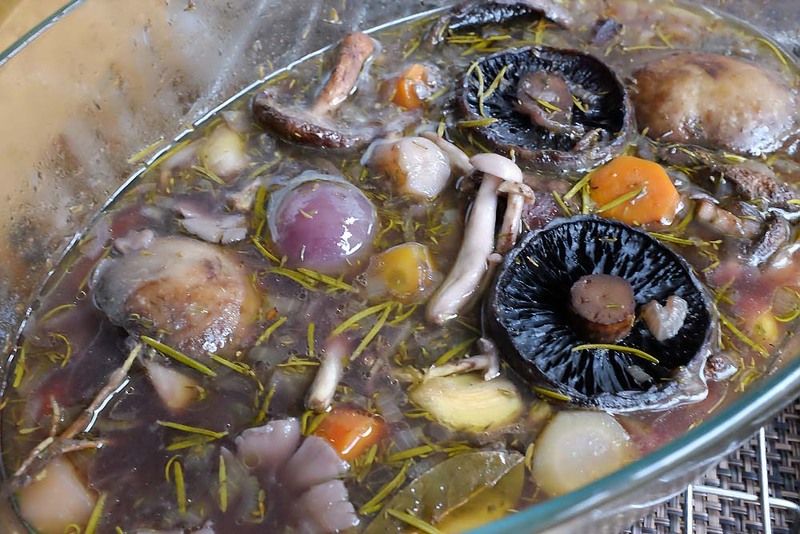 Yes, another one, that is perfect for those cooking up a feast for the Halloween weekend. The black comes from black chickpeas and orange from carrots or course, for the beady eyed amongst you there are some 'brain like' pieces in the bowl too, this is cauliflower that has turned orange from the turmeric. 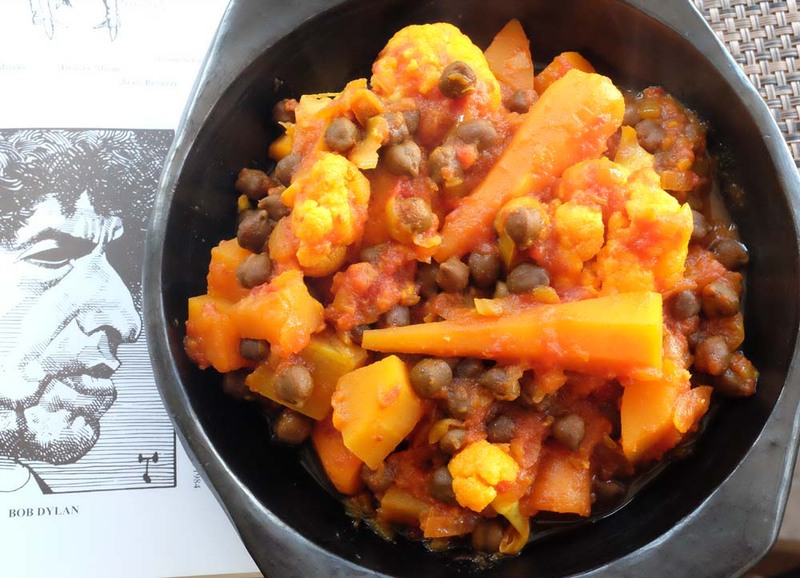 The recipe is adapted from my vegan Marrow Curry with Chickpeas, but this one is studded with black chickpeas and in place of the marrow, carrots and cauliflower. Please don't worry too much if you can't find black chickpeas where you are, just substitute it with the traditional variety. So apparently its World Pasta Day and it is truly by coincidence that today I blog this pasta dish. Black food or dark coloured food continues to dominate my blog in the run up to Halloween and today I have a whopper. I thought surely someone must have made a Black Garlic Macaroni Cheese recipe. I googled and there was no recipe for black garlic pasta, yeah a little grated like parmesan - but not drowned in black garlic dyed cheese - no doubt, now there will be some more now. Here is my Black Garlic Pasta Macaroni Cheese before going into the oven for the final bake. I promise you it gets much darker on baking; and you will have to take my work for it as I didn't take a picture of it, blame it on the dark evenings. I adore my husband for allowing me to experiment in the kitchen and eating whatever I present to him. 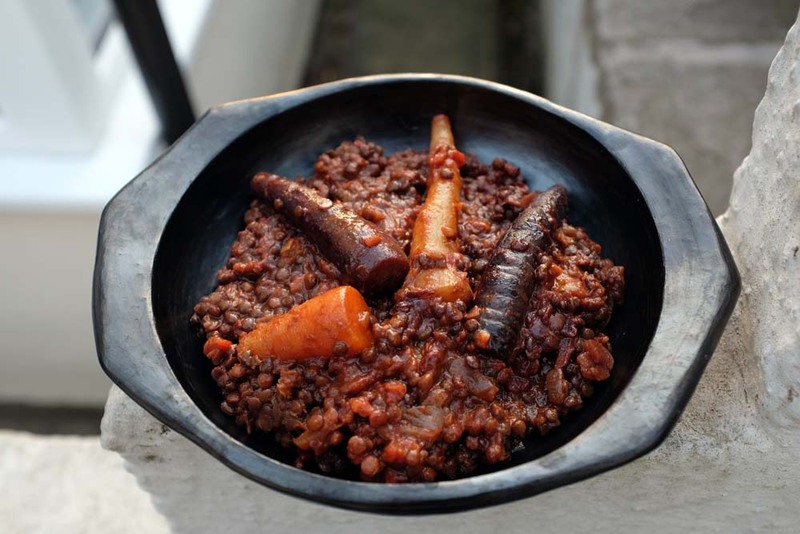 We have rarely ever thrown a dish in the bin, not always delicious, but always edible. This was a really rich and quite tasty actually. The black garlic adds colour, but also balsamic zingy sweetness. Please do serve it with some salad greens, but you'd do that right with a macaroni cheese to balance the cheese indulgence guilt, or it that just me?! By the way, for those of you who follow me on twitter will have noticed that I have changed my photo avatar to keep it seasonal, right! But for those of you who do not follow me on twitter - here it is. It was taken in the city of Cardiff last year, I had wondered whether I'd get to share it and I have. 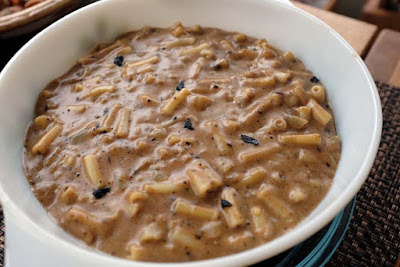 I am sharing a Black Garlic Macaroni Cheese Bake #CookOnceEatTwice hosted by Searching For Spice. 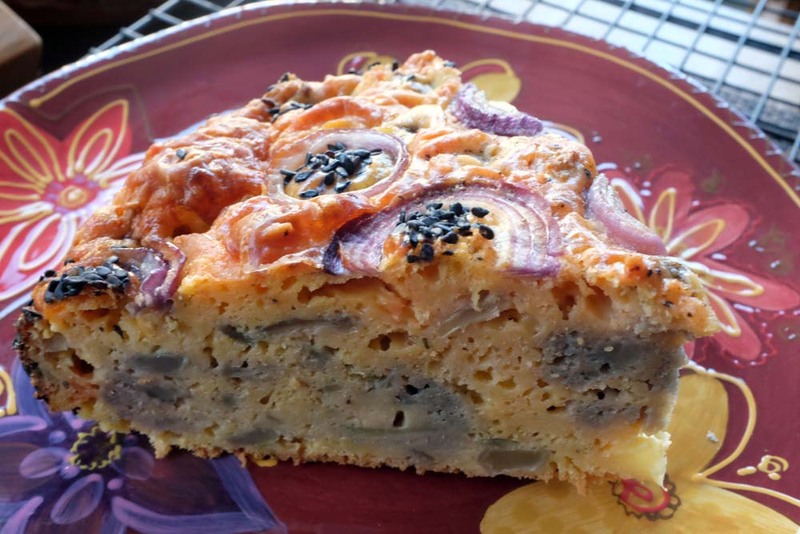 Yes, this is a play on 'Satan' - Seitan's cake and with Halloween not that far away, I do like to make freaky food around this time of year to amuse myself, if no one else. I admit its strange as I don't participate by dressing up and attending Halloween fancy dress parties. 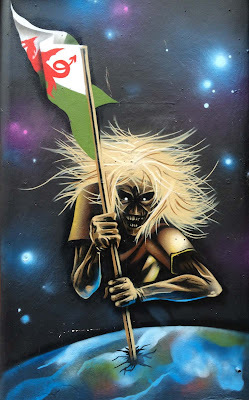 The closest I get to it is when the children in the street dress up and knock on the door to 'trick and treat' - yes, its become a big thing in this part of the Welsh valleys. Let me tell you a story from my childhood. At primary school one of the teachers told us a story about this Welsh lady in traditional Welsh costume wearing a paisley shawl. I don't remember very much about the story, but what stuck with me was that if you looked closely at her Paisley patterned shawl, you could see the devil's face. I've always been fascinated in that kind of stuff, which may explain my liking of supernatural and psychological films and dramas like Hinterland. The first series of Hinterland also references the painting of the Welsh lady in the shawl attending a small Baptist chapel, near Harlech, North Wales. It was in my adult life that I learned that the painting was called Salem (1908) by Sydney Curnow Vosper; and that he denied deliberately painting the devil in the shawl, but he did admit to painting another ghostly figure in the painting, which I never noticed. Look at the window! Please follow this link if you want to take look at the painting that I write about - the window and the shawl. If you can't quite make out the devil in the shawl, then follow this link by Wales On-line that illustrates horns, eyes and mouth. It still gives me the chills. 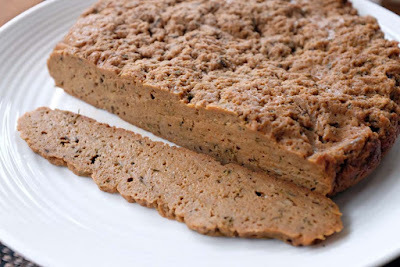 Back to my seitan - 'satan' cake . I've been experimenting with vital wheat gluten a lot lately. I think this is the best one so far that I have made, that is versatile in so many recipes. 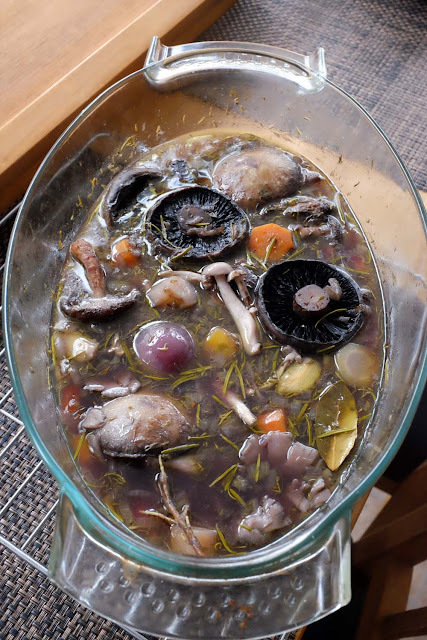 This is not the most attractive looking of dishes that I have shared on my blog, but I think its the perfect time for to pretend and say that I made it for a Halloween party and what you are seeing here are some damn ugly zombie or monster fingers coming out of the earthy ground. Truth is, this is spicy beluga lentils chili or sorts enhanced with chilli chocolate and the so called fingers are actually rainbow carrots. 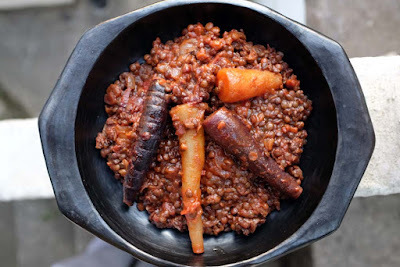 I guess to make this dish look even more horrific, I should have only used the purple carrots, that appear to be more effective in resembling fingers with the wrinkles. Despite the way it looks, it actually tasted okay. 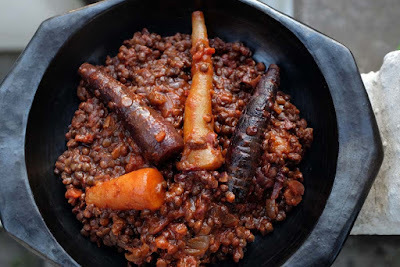 I don't cook that much with Beluga lentils as Puy lentils tend to be my go to in terms of sturdy lentils that keep their shape and do not disintegrate upon long cooking, but don't let that stop you from making this dish (if you dare), you can use brown lentils, I find them just as tasty, if not more so. 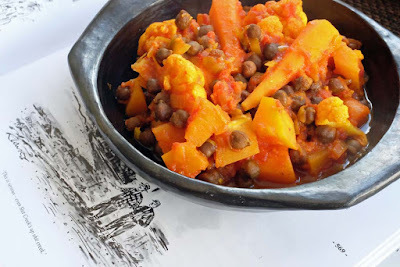 I served these with sweet potato wedges, soured cream to dampen the hotness, and even for me it was really hot I am sharing this with My Legume Love Affair #121 hosted by Jagruti Cooking Odyssey. The challenge was started by Susan from The Well Seasoned Cook and continues thanks to Lisa's Kitchen. I have more autumnal coloured food coming your way, but here is one that you may want to consider making for your grown up Halloween Party. I made this Carrot Rice Pilau with some rainbow carrots. 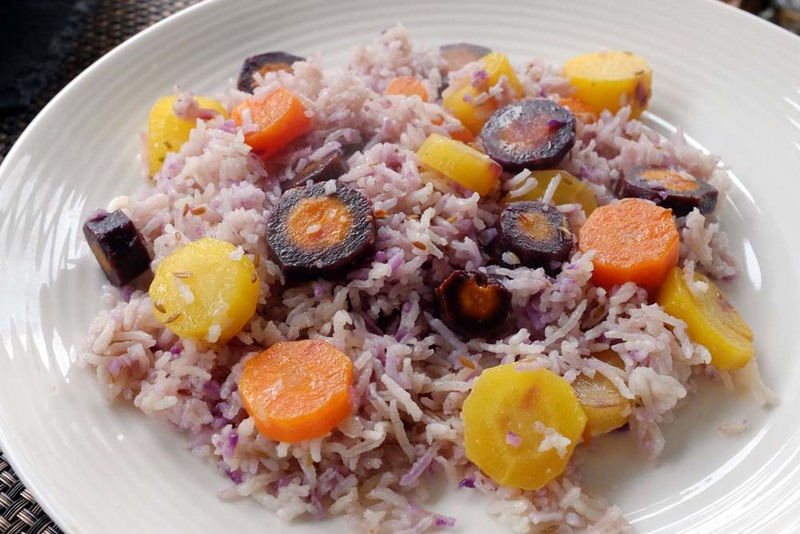 I was quite surprised how the purple carrots bled into the white basmati rice and tainted it with a purple hue. It actually looked quite pretty and quite nice to eat. 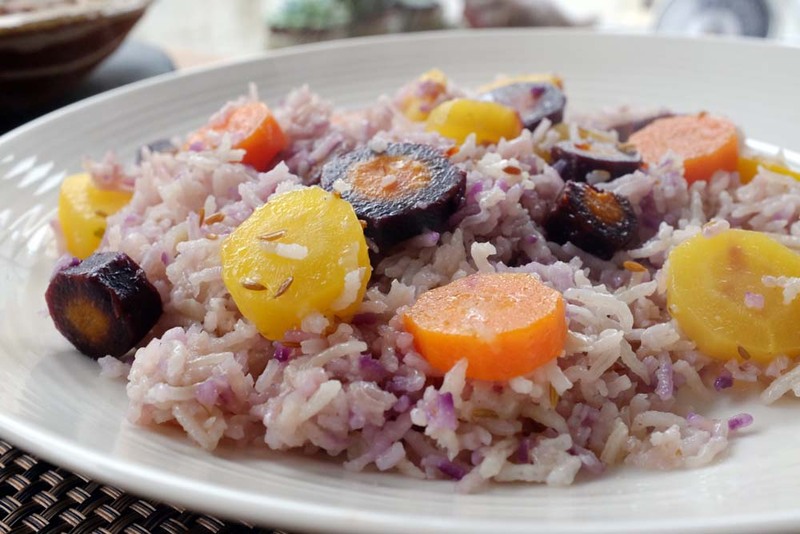 As I had some left over, I decided to take some into work for lunch as a savoury rice salad dish. You could reheat it in the microwave or eat it at room temperature. So I have decided to share it with Soup, Salad and Sammies Sundays hosted by Deb over at Kahakai Kitchen. By the way this is not the traditional way of making pilau rice that comes from the Indian Sub Continent, but it was still very flavourful. 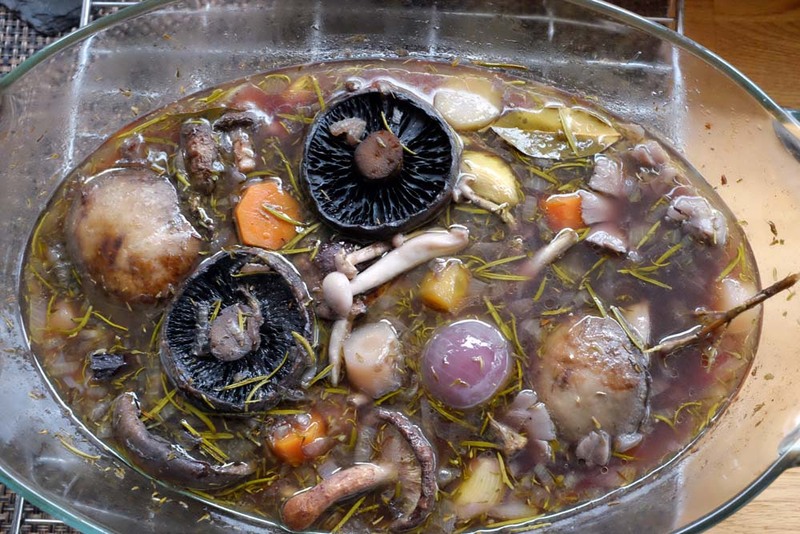 I adapted a recipe that was also adapted by the cookbook authors. A few weeks ago I went on a fungi forage, except it wasn't a fungi forage - 'why would you want to eat them?' exclaimed the fungi expert when he heard one of the participants (not me) ask her friend 'are these edible?'. The reason I am talking about mushrooms is because my Bourguignon here looks a bit like an autumnal forest ground - mushrooms, green grassy colours from the long needle shaped leaves from rosemary herb, leaves in the form of bay leaf and lots of autumnal colours, but here everything is edible - I wonder what Alice in Wonderland would think?! I think this dish is best made on a day like today when it's awfully dreadful, damp and dreich outside in Cymru aka Wales. I am so glad its the weekend and I don't have to be in work or anywhere else today and can stay in the comfort of my home. I am glad of it actually as its been a rather busy week at work too. As well as a medley of mushrooms, I had also picked up some rainbow carrots from the market in Cardiff, and if that did not provide enough colour - I decided in place of shallots to throw in some small red onions. If you look closely you will even seen flecks of green from fresh rosemary from the garden. We will be tucking into this textual dish with some homemade overnight sourdough bread later to mop up that rich vegetable flavoured gravy; and if we have some left over, perhaps with some mashed potato. The weather is so changeable at the moment, its gone all warm again. 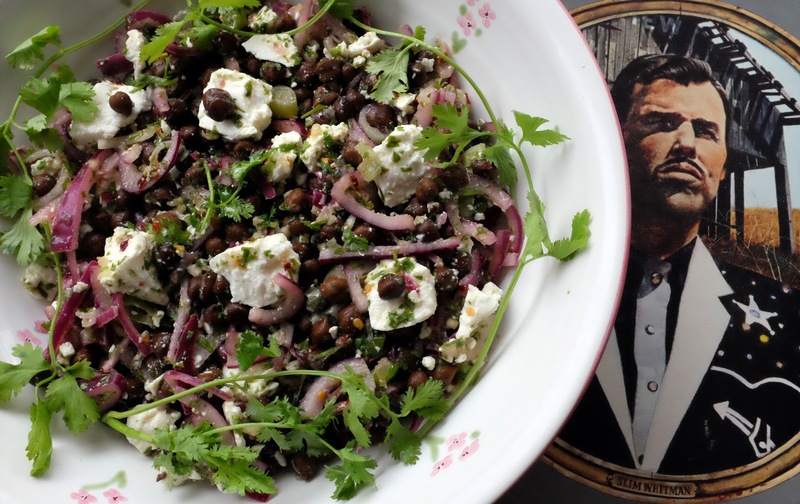 I came home a little earlier than usual and wanted to eat something quite light, hence this Black Chickpeas Salad with Coriander. Of course, this was not going to be enough as a meal for two, so alongside the Black Chickpeas Salad with Coriander, I made a Tomato Tarte Tatin. It made for a nice change. 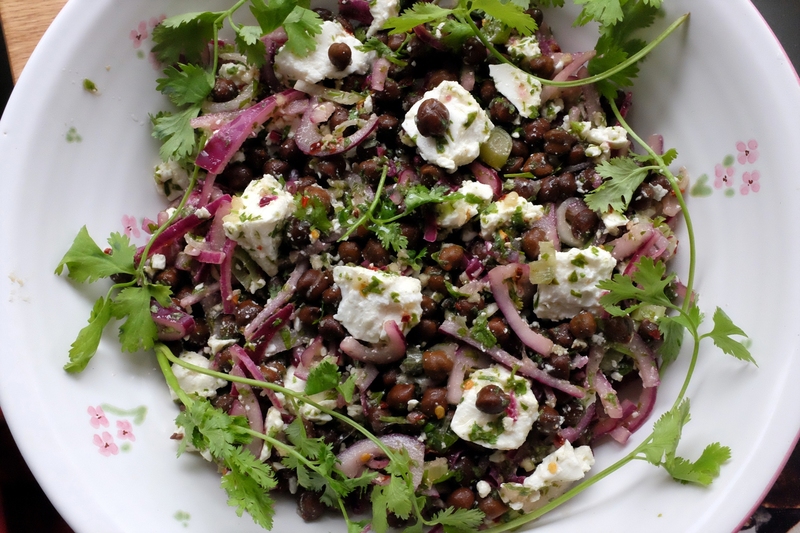 The feta here is optional, I used it as that is what I had in the fridge, but you could substitute it with halloumi cheese or if your going for a vegan or dairy free option, perhaps smoked tofu. I think you need a soft texture with the nutty black chickpeas and the fragrant herb brings it all together. What I like about this salad too, it that it is quite seasonal in colours - going all autumnal, but also a perfect salad to knock up for a Halloween feast if you are planning a vegan or vegetarian Black Food Menu. 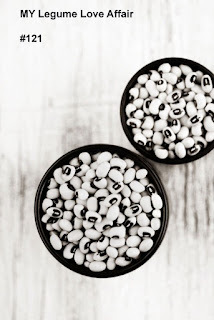 Please don't worry too much if you can't find black chickpeas where you are, just substitute it with the traditional kind, but do try and find them - You will always find them in South Asian supermarkets or greengrocers and they are sold as Kala Channa. However, I have noted over the past couple of years, even supermarkets are selling Indian brands labelled as Kala Chana and they are reasonably priced, you can get three tins for a pound in some places (see here), and in a time of austerity - every pound matters. You can even find the dried variety too, but that takes a little more forward planning. 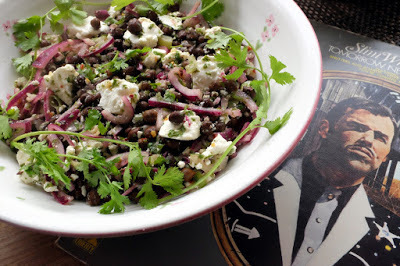 I am sharing this Black Chickpeas Salad with Coriander with Souper Sundays hosted by Kahakai Kitchen. I mentioned before, I don't always get to join in, but it is a pleasure when I do. Thanks for hosting Deb; and also #EatYourGreens Vegetarian and Vegan Blog challenge hosted by me this month. Eat Your Greens is also co-hosted by The VegHog. Please do join in. For those of you who have not participated before, please Follow this link on how to join in .